Share your knowledge and raise your profile by contributing to the June 2019 EBA Journal! Showcase your expertise, case studies, and thought leadership in the next EBA Journal! We are seeking content for the June 2019 edition of EBA Journal. Submissions are due May 1st. We welcome various formats: articles, technical research papers, surveys, interviews and Q&A. This is an exclusive EBA membership opportunity, and submissions will only be accepted from EBA Members and Affiliates. New Feature: Members on the Move! Please share your announcements, promotions and awards news. 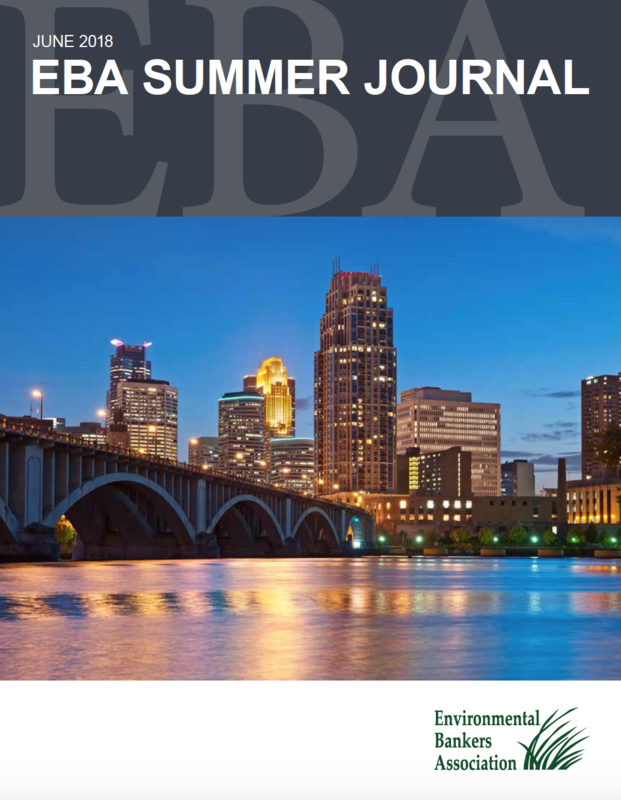 The summer edition of the EBA Journal will be distributed at our conference in Philadelphia, June 9 - 12, 2019, and available online to EBA members post conference. Submit your content through the EBA website or to Elizabeth Krol and Lisa Kraus Gardner. Article length may range from 800-2500 words. Technical and educational topics of interest to the EBA membership are requested. If you're not seeing the full library, be sure to log on to the website with your username and password. EBA and Authors Copyright Disclaimer: These documents and resources are provided solely to members of the Environmental Bankers Association, Inc. (EBA) for informational purposes only. EBA members are authorized to use these materials for internal reference or training purposes, but are not authorized to disseminate or publish any portion of the document to non-EBA members or the general public without prior written consent from EBA. Non-EBA members are not authorized to use these materials for any purpose without the prior written approval of the EBA. Neither the EBA, nor any of its directors, officers, employees or agents, nor any of the Authors makes any representations or warranties, express or implied, or assumes any legal liability for the completeness, reliability, timeliness, currency, accuracy or usefulness of the information provided herein, or for the applicability of the information provided herein to the facts and circumstances particular to any specific use, including but not limited to information found through any links or references to resources, case studies, projects and/or services referred to within these resources. The viewpoints and information provided by the Authors is their personal viewpoints and information, and not the viewpoints or information of the organizations of which they are employed or affiliated. Any action taken based upon the information provided in or through these documents and resources is done so strictly at your own risk. Neither the EBA nor any of the Authors shall be liable for any damages of any nature incurred as a result of or in connection with the use of this information. These materials and the information herein do not constitute legal or other professional advice or opinion. It is recommended that you seek appropriate legal or other professional advice to determine whether any advice, actions or practices referenced within these resources is appropriate or legally correct in your jurisdiction. Some of the material provided herein has been published with permission of the copyright holder and is not the copyrighted content of the EBA. Where applicable, attribution to the copyright holder has been given herein. No permission is granted to republish any such content without seeking express permission of the copyright holder.